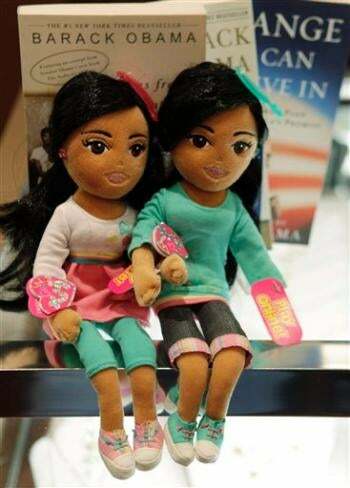 Malia and Sasha Dolls from Ty Inc. The makers of the Beanie Baby Dolls have unveiled their latest: Sweet Sasha and Marvelous Malia. A couple of bronze-skinned dolls who the company insists are not inspired by Barack and Michelle's daughters, in name or resemblance. However, every Sarah, Kendra and Bobby, too, will be directing their parents through wind, sand and rain to get their hands on these beauts. Hey, I think it's a good thing for American children to have an opportunity to consume like anybody else. I mean, it is the American way. But this "pimping the Obamas" frenzy has gotten out of control. From life-sized Obama sculptures to Michelle Obama dinner specials featuring poached pears [I didn't know she liked poached pear], the frenzy is reaching its nauseous level. And although the Ty Company, owners of Beanie Babies and Sasha and Malia, claim the dolls are not inspired by the President's daughters, I beg to differ, and they may have to do some legal explaining—the Obamas have a say in what images of themselves get the greenlight.